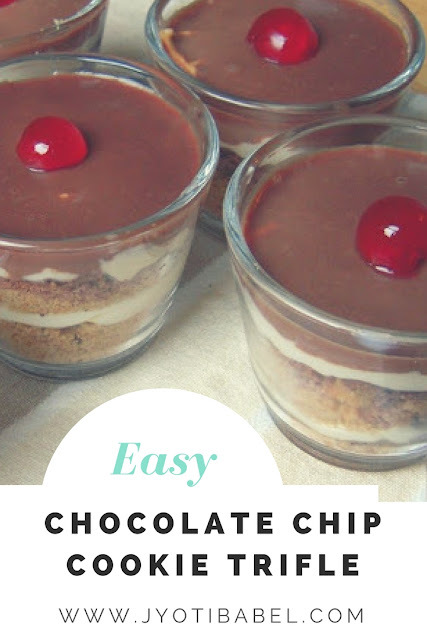 Chocolate Chip Cookie Trifle is a layered dessert that can be whipped up in minutes if you have some chocolate chip cookies and fresh whipped cream at hand. It's simple yet delicious and when served in individual glasses, it looks quite pretty too. Yesterday, we had a small get-together at my place. It was an occasion to bid a formal farewell to our friend T who is going back to India for good and to convey our heartfelt wishes to N, who is a to be a mother! Our get-togethers are not just about meeting one another but also about food. It gives us an opportunity to flaunt our culinary talent :-)! Lemonade, Kiwi Panna,Orange Juice, Onion Bhaji, Mint flavoured potato puffs, Savoury Semolina Cake, Shakarpare, Vegetable Paneer Lasagna (At least I intended to make that, but the outcome was different, but my friends said it tasted good and I believe them! ), Chocolate Cupcakes, Vanilla Cupcakes and my Chocolate-y Trifle! On top of these, there were lots of chocolates! Well, I am sure you will say that is quite a menu and I agree. Here are some pictures too! 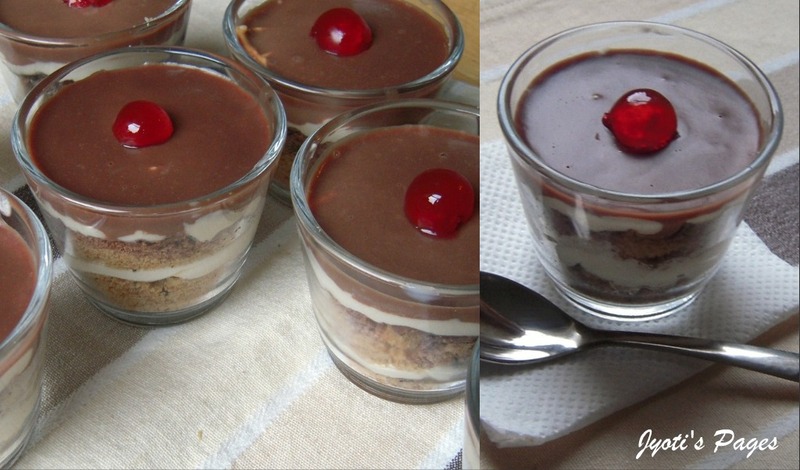 Now coming back to the recipe of my Chocolate-y Trifle which actually Chocolate Chip Cookie Trifle. I got this recipe from my elder sister and have tried a couple of times before. My DH loved it too. So, instead of experimenting something on my friends (which I usually do), I went for the safer bet. This is a very easy recipe and if you love chocolate, it's for you! 1/4 cup icing sugar or finely powdered sugar. less than 1/2 cup of grated chocolate. 200 gm chocolate chip cookies. 4 glace cherries cut in half for decoration. The measures will vary according to the size of bowls you are using. I made them in individual small glass bowls and I got 8 servings with these measurements. 1. Put the cookies in a ziplock bag and run the rolling pin over it so that they are coarsely crushed. Keep it aside. 2. Whip the fresh cream and sugar until stiff. 3. For ganache, melt the chocolate either in a microwave or by putting in in a heatproof vessel and placing it over hot boiling water. When melted add the cream and oil if using and stirring well till everything is well incorporated. Keep it aside. 4. Now take the bowls u are using and line it first with the cookie mixture and then a layer of the whipped fresh cream. You can use an icing bag to make a layer of cream or use a spoon. Then line it with grated chocolate. Again put a cookie mixture followed by cream and top it with ganache. You can make as many layers as possible. Top it with a glaced cherry. 5. Keep it in the fridge for a day (See notes). The cookie mixture must absorb the moisture of cream and lose its crunchiness. Take it out of fridge 10 mins before serving. 1. It is always better to make it a day in advance. 2. If you are making it on the same day. Keep it in the freezer for 45 mins and then take it out for an hour. Keep it back in the fridge until needed. The temperature difference it will face will make the process faster. 3. While making the layer of cream, if the cream stick and is not spreading evenly then take a cup of hot water and dip a clean spoon into it and then smoothen the cream with it. Dip it in hot water as many times as necessary. Here are some more chocolate dessert ideas for you to check out. Sending this to Lets Celebrate Sweets-Chocolate. This event is the brain child of Nivedita. What lovely little trifles. I love how cute they look all layered up in those cups. I have a linky party every week on my blog called "Sweets for a Saturday" and I'd like to invite you to stop by this weekend and link this up. It was yummy! Thanks Jyoti for the above recipe, I will also try someday. See you soon. woww...beautiful...m tryin it right now! dont think ill b able to wait for 2mro to eat it!